The Swift M10LB digital microscope is a great microscope for teaching or just ease of use. The microscope has a built-in 5 mega pixel camera. The 3" digital LCD screen shows a live image from the microscope. The press of a button allows you to capture and save this image. Downloading images is easy as well, just remove the memory card from the microscope and take it with you, or download to your computer. 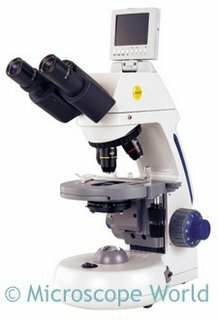 The Swift M10 microscope is perfect for veterinarians, teachers and students.